This article has been prepared by Leanne Fitzsimmons by request of Katrina Jeffery of www.maremmano.com Leanne was, at the time of writing, the practice manager of Veterinary Imaging Associates, a practice of specialist veterinary radiologists who are members of the Australian Veterinary Association (AVA) panel of veterinary radiologists certified to provide hip scoring for canine hip dysplasia. They also provide hip and elbow dysplasia advice to interested individuals and are also PennHIP® licensed. Veterinary Imaging Associates is the only practice in Australia that has two specialist veterinary radiologists who view each hip evaluation radiograph sent for scoring. Conventionally, CHD is diagnosed radiographically by the presence of degenerative changes and/or subluxation of the hip. The role of subluxation is crucial in the development of CHD but is often camouflaged on the most commonly used radiographic projection of the hips. Radiographic evidence of osteoarthritis confirms secondary changes of CHD, characterised by periarticular osteophyte formation (bone spurs), signs of subchondral bony sclerosis and bony remodelling. The current system used for scoring radiographs for hip dysplasia in Australia is based the system devised and used by the BVA/KC. There are nine criteria (see diagram). Scores between 0 and 6 are allocated for all criteria, except the caudal acetabular edge, for which the maximum score is 5. Higher scores indicate greater degrees of radiographic abnormality. The scores for the right and left joints are added to give a total hip score. The anatomical landmarks used for scoring are illustrated. For a number of reasons it is not possible to rigidly standardise the information provided by the radiographic image of a complex structure such as the hip joint. Some of these reasons are: - conformation; there is a wide range of variation both between and within breeds, - position; minor positional variations are accepted and their effects recognised and taken into account during the scoring procedure, - radiographic technique; lack of contrast due to inadequate developing, under or overexposure, failure to use a grid, grainy film/screen combinations, use of x-ray tubes with large focal spots, - observer error; (to minimise this in evaluation of abnormalities our practice, Veterinary Imaging Associates uses two readers to examine each radiograph). Norberg Angle (NA): gives a measured assessment of several features; the degree of congruence between the femoral head (FH) and acetabulum; the length of the cranial acetabular edge (CrAE), which gives a relative indication of acetabular depth and a measure of coxofemoral subluxation (laxity). Subluxation (SL): is based principally on the degree of congruence between the femoral head and acetabulum. The general 'fit' of these two components is assessed by the relationship between the femoral head centre (FHC) and the underlying image of the dorsal acetabular edge (DAE). 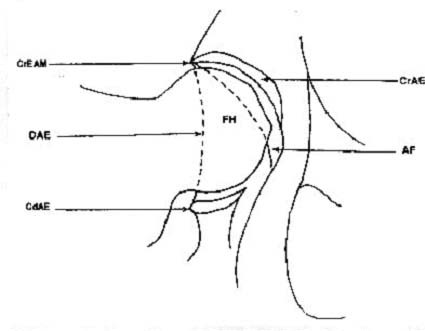 The cranial joint space is seen as a radiolucent shadow between the CrAE and adjacent cranial articular margin of the FH. - score of 0 - the FHC must be medial to the DAE and the cranial joint space uniformly narrow, with the curve of the CrAE exactly following that of the FH. - score of 1 - mild divergence of the cranial joint space, either medially or laterally, with the FHC remaining medial to the DAE. - score of 2 - superimposition of the FHC on the DAE (with the FH in this position, the cranial joint space will inevitably diverge). - score of 3 - includes a wide range of femoral positions, with anything between less than one-half and more than one-quarter of the FH lying medial to the DAE. - scores of 4 and 5 - are given for severe degrees of subluxation. - score of 6 - complete separation of the images of the two components. Cranial acetabular edge (CrAE): minor alterations in the shape, contour and possibly the length of the CrAE are generally believed to be indicators of poor articular congruence, while more severe changes are clearly consequences of chronic instability, abnormal marginal wear and remodelling of the joint. - score of 0 - the CrAE should be concave, uniformly curved and match exactly the contour of the adjacent femoral head with no lateral or medial divergence of the cranial joint space. - score of 1 - minor flattening of the outer quarter of the CrAE with slight divergence of lateral joint space. - score of 2 - the CrAE is flattened throughout most or all of its length and there is usually both medial and lateral joint space divergence. - score of 3 - higher scores are given when there is positive evidence of abnormal wear and/or remodelling of the edge. Early change is manifested by slight bilabiation, which shows as cranial curvature of a small outer segment of the CrAE. - scores of 4 and 5 - are given to progressively more extensive bilabiation and cranial orientation of the edge. - score of 6 - development of a steep cranial slope. Dorsal acetabular edge (DAE): the DAE forms a well defined interface which traverses the FH almost vertically and extends a little beyond it cranially and caudally. The clarity with which it can be seen is highly variable, depending on radiographic technique. - score of 1 - a minor change in the contour of the DAE, which is normally slightly curved but small localised irregularities, seen only on radiographs of exceptionally high quality, are considered to be within normal limits. - score of 2 - related to definitive pathological changes associated with degenerative joint disease (osteoarthritis), the smallest being minor exostosis, which is usually seen cranially. - score between 3 and 6 - progressively increasing new bone formation accompanied by marginal wear of the edge, which leads to reduction in width of the articular surface and thus contributes to subluxation according to severity. - score of 1 - the earliest detectable abnormalities of the CrEAM are either minor exostosis, usually in the form of a small, well modelled osteophyte, or slight 'rounding off' of the junction between the CrAE and DAE, which may be seen in the presence of a non-bilabiated CrAE. - score of 2 - more advanced changes at the CrEAM are indicators of abnormal wear and must therefore be associated with articular instability. Initially, a small facet forms on the rim (margin), usually in conjunction with minor bilabiation of the CrAE. Exostosis may or may not be present. - scores of 3 to 6 (depending on severity) - increasing secondary changes lead to the development of larger facets and exostoses, which can become massive and extend well up the shaft of the ilium. Acetabular fossa (AF): it is well recognised that the acetabular fossa and notch are sites of bone proliferation in unstable hips, an impression of the amount of new bone present may be gained from the size and intensity of indistinctly marginated areas of increased opacity in the region of the caudomedial acetabulum and obliteration or partial obscuring of the normally clear radiolucent shadow which represents fat in the acetabular notch. Detectable bone deposition in the AF is almost always associated with marked subluxation and the amount tends to increase in proportion with the increase in the other radiographic hallmarks of secondary osteoarthritis. Objective numerical scoring of this criterion is difficult, but as changes are likely to be recorded only in dogs with a total score considerably higher than average, the importance of a high level of accuracy is diminished. Caudal acetabular edge (CdAE): is the segment of the acetabulum which is subject to the widest range of normal radiographic variation. It is dependent to a large extent on the pelvis/film angle, but may also be influenced by individual differences in conformation. Radiographic abnormalities of the CdAEs are scored between 0 and 5 and changes are due mainly to exostosis, with signs of wear being apparent only in advanced cases. - score of 1 - a small osteophyte on the CdAE. - score of 2 - new bone localised laterally and medially adjacent to the acetabular notch. - scores of 3 to 5 - are used to record progressively increasing bone proliferation which ultimately fills the notch and produces extensive remodelling. - score of 0 - the normal FH should have a smooth roundish profile but the shape may vary considerably. - score of 1 - a well defined, vertically orientated ridge of new bone extending from the base of the neck towards the trochanteric fossa (Morgan and Stephens 1985). Correct exposure and good radiographic detail are required to show this earliest recordable change. - score of 3 - is given when a distinct collar of new bone is visible around the articular margin. - scores of 4 to 6 - denote increasing amounts of periarticular proliferation which at its most severe, extends to cover the femoral neck and fill the trochanteric fossa. - score of 6 - permanent luxation in which the FH is grossly deformed, small and almost conical in shape. This system of scoring radiographs for hip dysplasia has the advantage that the requirement to assess a number of specific anatomical landmarks ensures relatively objective evaluation of each joint. In addition, the wide range of score points available permits small differences between hips to be recorded. It can be assumed with some confidence that any individual hip score of above 10 will be an indication either of gross instability or of clearly established secondary change. For effective utilisation of this hip reporting scheme one must ensure a high level of participation by breeders (>90%) and rigid compliance (no shopping for more favourable scores) with recommendation made by the interpreting radiologists and veterinarian obtaining the radiographic image. An open register of hip scores is essential to ensure a level playing field and a record of scores of progeny will add significantly to the value of recorded information of any dam or sire. Currently, we recommend using dogs whose score is lower than the breed average. Some breeds have high 'average' scores (>10) - for these we recommend using dogs with scores less than 10. Despite concerted efforts of organisations like the OFA in the United States, the British Veterinary Association/British Kennel Club (BVA/KC) and other European groups over the last 20 to 30 years to screen for CHD employing the extended hip view, CHD remains common in many breeds.